Ahoy, me Hearties! Tomorrow be International Talk Like a Pirate Day and what with knottin' bein' all tied t' sailin' (didja see what I done thar?) what better way t' pay me respects but t' create a piece o' micro macrame! Boy, writin' like tha' is harder than ye'd think! And out of all that booty, which treasure did I choose first? They're just so ever-lovin' adorable!! And what with the pirate day thing coming up and all, it seemed like fate. I did make a very similar bracelet with one of her owl focals instead, if ye ain't be likin' the skulls. Wanna try your hand at knottin' one yeself? These bands are variations of me Micro Macrame Bracelet Watch class at CraftArtEdu.com. Fair winds, mateys! 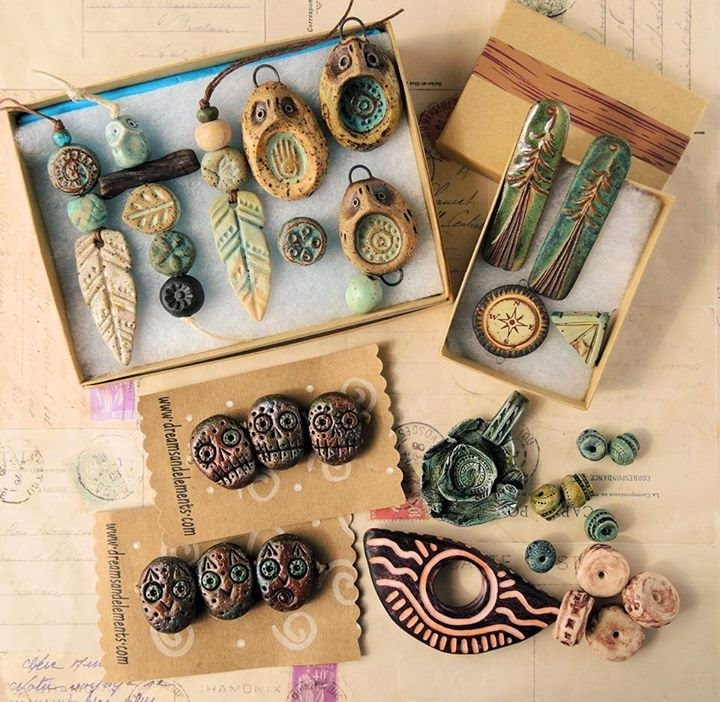 What cool beads ... and beading ... and collaboration! Oh, I love this. Not easy to talk like a pirate. This bracelet can be worn year round, I really like it. Cannot wait to see what you do with the other creations. I love LOVE this bracelet and want to make one. 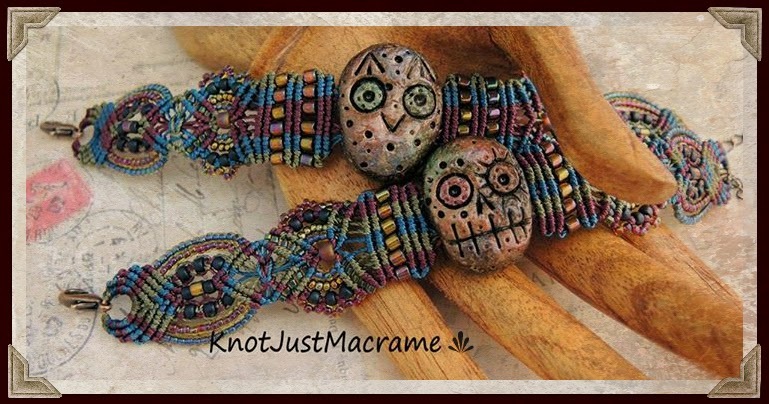 I bought one of the adorable beads and your micro macrame bracelet watch tutorial The watches have these brackets or rings on the sides that you can tie the thread on with knots and then start the macrame work, but the bead just has a small hole through it. 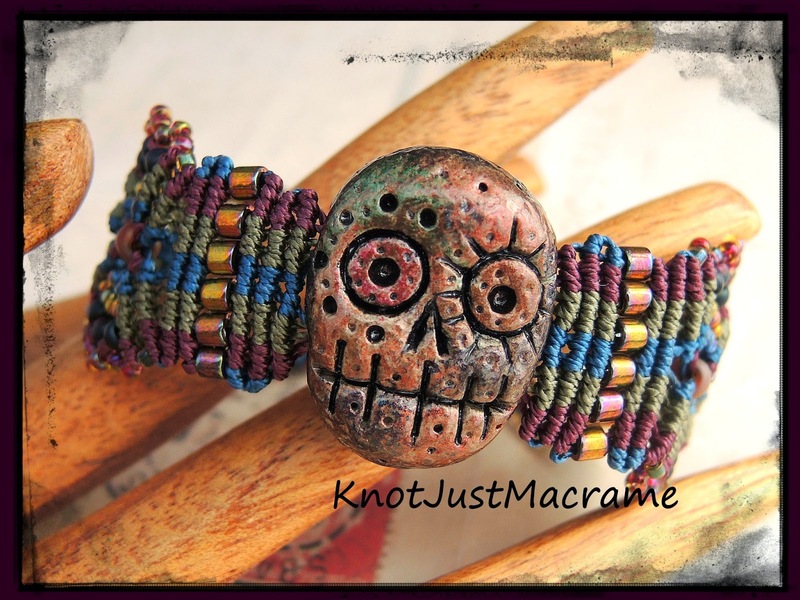 My question is; how do I get started to macrame on the sides of the bead. Can you get me started? I'm not clever enough to figure this one out!